The Cadillac ATS and CTS sedans are not long for this world, and will permanently bite the dust as soon as they reach the end of their production cycle in the next year and a half or so. 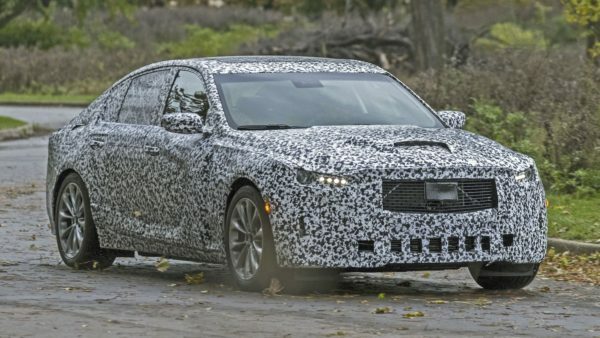 As such, a fresh four-door replacement dubbed the CT5 is undergoing real-world testing as we speak, as evidenced by this new batch of spy shots. 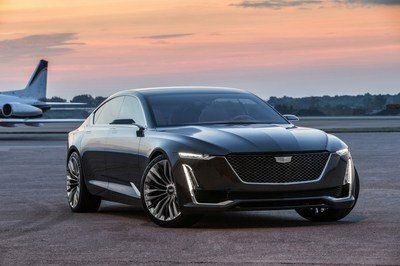 Back in July, General Motors announced that Cadillac would ditch the ATS and CTS lines in favor of a single model, namely the up-and-coming CT5, ushering in a new era for Caddy’s luxury-stuffed four-doors. 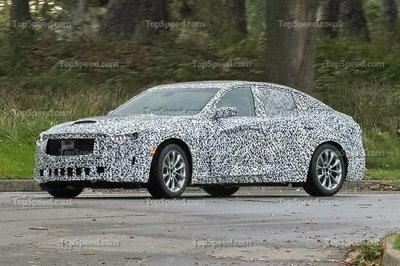 Now, we have our hands on the first batch of spy shots to reveal the 2020 Cadillac CT5, showing it in camo’d form out and about on wet, leaf-strewn streets in preparation for a launch sometime next year. 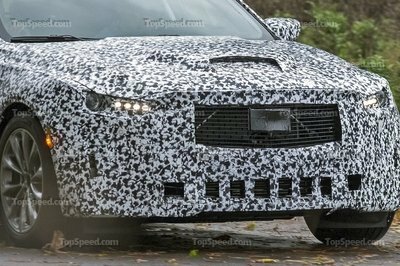 Of course, GM is playing this one rather close to the chest, outfitting the test mule with somebody components intended to throw us off the scent, including a bolstered bodywork in the flanks and a sizable hood scoop to boot. It’s the sort of components that, at first glance, are meant to suggest the this isn’t a Caddy, but rather some kind of upcoming Dodge Charger. However, GM ain’t pulling a fast one this time. We’re on to your game! 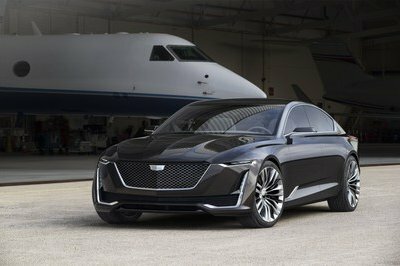 The new CT5 is reportedly codenamed the A2LL, and will take its styling cues from the Cadillac Escala concept that debuted at the Pebble Beach Concours d’Elegance in 2016. Features include a coupe-like roofline, which falls into the shortened rear end to create some subtle cab-back proportions along with the extended hoodline. And obviously, it’s impossible to tell exactly what’s going on under all that body wrap and faux padding, but we can still pick out a few details here and there. The nose appears to employ a large, crest-like grille for the central intake, as well as a slimmer lower intake and side intakes as well. The headlights appear quite slim in shape, and look to include LED lighting elements in horizontal lines with outer main projectors. There’s also a pair of side markers just ahead of the front wheels along the inner fender lines. Under the skin, we expect the CT5 to get the next-generation Alpha platform from General Motors, or more specifically, the long wheelbase iteration. As for the powertrain lineup, the CT5 will use all the familiar engines we’ve seen from Caddy in the past. These will include a 2.0-liter turbo four-cylinder, a 3.6-liter V-6, and of course, GM’s party piece, a supercharged 6.2-liter V-8 for the hot-to-trot V-Series trim line. We’re also expecting a plug-in hybrid version of the 2.0-liter four to drop shortly after the CT5 launches. As for the rest of the drivetrain, a 10-speed automatic will be used across the board, with performance enthusiasts grabbing the six-speed manual in the V-Series. Both AWD and RWD will be offered (RWD as standard and AWD as an option), while the V-Series will be exclusively RWD. Production will kick off in Q2 or Q3 of 2019. The CT5 will be built at GM’s plant in Lansing Grand River.